Help Show Your Support for Our Teachers & Staff! 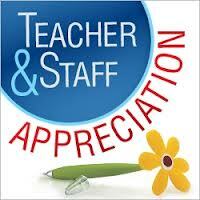 Teacher & Staff Appreciation Week begins Monday, May 12th! We need your help to show our out-of-this-world SWCS teachers and staff some love! There are many ways to help and most of them don’t require a lot of time or work. Take a look at the Sign Up Genius links below to see how you can show our teachers and staff the appreciation they deserve! Sign up at http://www.signupgenius.com/go/5080E49A9AD29A46-help – several tasks will take 30 minutes or less of your time. If you don’t have time for these tasks, see below for other easy ways to express your appreciation. Bring in flowers at drop off on 5/13 – cut from your garden, or pick up from the store, no need to go to the flower shop, volunteers will make assemble a bouquet for each teacher and staff member. Accepted at drop off on 5/13 only. We also looking for parents who can stick around after drop-off on May 13th to assemble the bouquets. Don’t be deterred from signing up for a task. Even if you can’t attend from 3-5 pm, many of the to-do’s the teachers have listed can be done when it’s convenient for you! Sign up at http://www.signupgenius.com/go/5080E49A9AD29A46-parent to help clean, organize, repair, and sharpen lots of pencils in all of the classrooms. If your child’s teacher is not listed please come anyway. There is surely work to be done! Contact Melissa Allen at melissaallen7@yahoo.com with any questions. Make a donation to the Elephants Lunch. Donations can be placed in the silver bin on the outside of Kathy’s desk. Donations accepted now through 5/14. Pick up some delicious Chocolate for Chocolate Love day when you go to the store anyway. Chocolate can be dropped off at the box on Kathy’s desk from now through 5/13. On behalf of Friends of SWCS, Melissa Allen melissaallen7@yahoo.com. This entry was posted in Staff Appreciation, Volunteer and tagged sign up genius, staff appreciation. teacher appreciation week. Bookmark the permalink.